It's a bird. It's a plane. No, it's a super… CGI sh**storm! That's what some of you will be thinking after trying to mentally process Man of Steel, Zack Snyder's much anticipated Superman reboot that is now playing in theaters from here to Krypton. 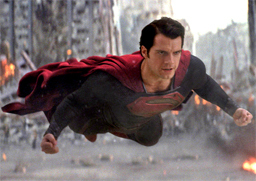 Supes (Henry Cavill) and Zod (Michael Shannon) have what seems like a 45-minute dizzying smackdown over, under and through the computer-rendered city of Metropolis, resulting in explosions, crumbling CG skyscrapers and pixel debris flying everywhere. It must be summer! Whether or not you see shades of God's truth in Snyder's visually exhausting corporate-sponsored supershow is entirely subjective, but Snyder is not the first director whose use of CGI effects builds to a stupefying vortex in the third act. When a director gets slaphappy with his bloated budget for CGI effects, the ending inevitably becomes a wicked whirlwind of pixels that seem to exist entirely on a hard drive somewhere, leaving viewers to wonder if any aspect of the CGI maelstrom they just witnessed was actually filmed. Here are five other super examples of movies that build to a swirling, CGI tornado of chaotic lunacy. Indiana Jones and the Kingdom of the Crystal Skull: Who can forget the grand finale of Indy's return to the big screen in which our favorite archaeologist watches safely from a green screen as a spaceship swirls its way up to the heavens? Bet you didn't see that coming after you first saw Raiders of the Lost Ark. Still, for those that want to dismiss this movie outright just because of all the fanboy knocks it has taken since its release, just look up its Rotten Tomatoes rating and compare it to Man of Steel, then pick up your jaw from the floor. Even with CGI excess, Indiana Jones and the Kingdom of the Crystal Skull has its moments and it's great to have Indy back. The ending just spins... up, up and awaaay! The Matrix Revolutions: When the Sentinels finally reach the underground city of Zion in the third Matrix film, it's a swirling mass of pixelated metal and machine guns as humanity fights for its right to make computers work overtime for special effects like these. It's overwhelming, but there is no practical way to film a futuristic sci-fi battle of this magnitude (we don't have any underground cities or sentient octopus-like flying ships), so enjoy the CGI buffet! Transformers: Revenge of the Fallen: You can almost hear director Michael Bay screaming "more pixels!" at a room full of frazzled designers typing furiously on computers to create this explosive battle between Optimus Prime and Megatron. You have to give Bay some credit for throwing in some real backgrounds and foliage for his "robots in disguise" to wrestle in, though. When a director has the good sense to do that, at least it adds a smidgen of tangibility. In Man of Steel, for example, see if you can spot the CGI herd animals that Supes soars over. You tell me why a computer is required to show running zebras on-screen. The Mummy Returns: This is one of the earlier examples of a CGI sh**storm, when folks were just learning how to wrap up a movie with a tornado of pixel dust. Watch as fake-looking palm trees get sucked into oblivion as our heroes dangle in front of a green screen above what looks like an Egyptian-themed video game. Is it any wonder why Rachel Weisz sat out the next sequel? Mercifully for fans of bloated-budget megamovies, CGI effects have improved exponentially since The Mummy Returns, which is -- aside from this merry-go-round ending -- an enjoyable romp. The Green Lantern: In what could be the ultimate on-screen CGI sh**storm, Green Lantern takes on an amorphous, mean-faced yellow cloud named Parallax in the gritty and realistic (kidding!) conclusion to a hot mess of a superhero movie. If this Green Lantern ever meets Zack Snyer's Man of Steel on-screen for a Justice League flick, we're going to need a bigger boat, er, computer to render the terabytes of shock and awe audiences now expect. All of the films listed above are available on DVD and Blu-ray as well as various VOD services.